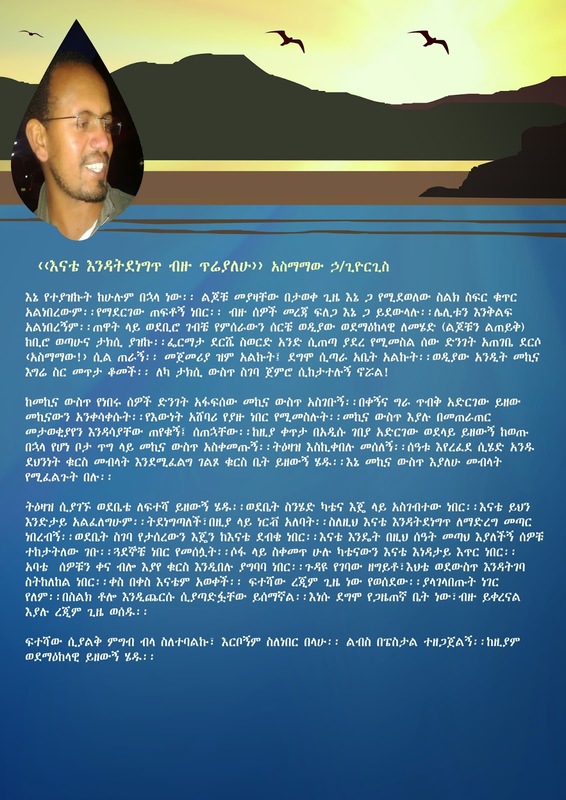 እኔ የተያዝኩት ከሁሉም በኋላ ነው፡፡ ልጆቹ መያዛቸው በታወቀ ጊዜ እኔ ጋ የሚደወለው ስልክ ስፍር ቁጥር አልነበረውም፡፡ የማደርገው ጠፍቶኝ ነበር፡፡ ብዙ ሰዎች መረጃ ፍለጋ እኔ ጋ ይደውላሉ፡፡ ሌሊቱን እንቅልፍ አልነበረኝም፡፡ ጠዋት ላይ ወደቢሮ ገብቼ የምሰራውን ሰርቼ ወዲያው ወደማዕከላዊ ለመሄድ (ልጆቹን ልጠይቅ) ከቢሮ ወጣሁና ታክሲ ያዝኩ፡፡ ፌርማታ ደርሼ ስወርድ አንድ ሲጠጣ ያደረ የሚመስል ሰው ድንገት አጠገቤ ደርሶ ‹አስማማው!› ሲል ጠራኝ፡፡ መጀመሪያ ዝም አልኩት፤ ደግሞ ሲጣራ አቤት አልኩት፡፡ ወዲያው አንዲት መኪና እግሬ ስር መጥታ ቆመች፡፡ ለካ ታክሲ ውስጥ ስገባ ጀምሮ ሲከታተሉኝ ኖሯል! I was the last to be arrested. Once their arrest becomes is known, I received enormous amount of phone calls. I did not know what I was supposed to do. Lots of people called me asking for information. I couldn’t sleep the whole night. I get to my office in the morning and quickly finished my work and left my office and grab a taxi heading to Maekelawi to visit my friends. When I get off at a taxi station, someone called my name; “Asemamaw”. The guy looks he spent the whole night drinking. I ignored his first call. I answered when he called me again. Immediately I saw a car pulling over just next to me. I just realized that they were following me starting from the taxi ride. The guys who were inside the car rushed me into the car. The hold me tightly from both sides and started driving. It looks like they just arrested a real terrorist. Once we were in the car they asked me for an ID in a very doubtful mind. I gave them. Then they drove to the direction of Addisu Gebeya and parked the car at some random corner and left me in the car. I think they were waiting for an order. One of the security official said he wanted to have his breakfast and they took me to a snack house. Those who wanted to eat had their breakfast while I was in the car. Once they got the order, they took me to my house for a search. I was handcuffed when we were heading to my house. I did want my mom to see this. She will be shocked. She has nerve related health problem. So I had to try my best to make sure that she would not be shocked. I was hiding my handcuffed hands from my mom’s eyes when we entered the house. My mother was wondering how I get back home at this time of the day while the guys followed my steps into our house. She though that they are my friends. I kept on trying to hide the handcuff after I sat down on the sofa. My father started to invite the guys for breakfast. He realized it is a serious issue when my sister was disallowed to get in. My mother also started to figure out what is going on slowly. It was a long searching. They were searching every corner. I can see that they are being told to hurry up through a phone. They replied that they need more time because it is a journalist’s house. I was asked to eat something when they are done. I was hungry and I ate. My extra cloth was packed in plastic bag. Then they took me to Maekelawi.